Propaganda really is the in thing in London this year. On 17 May the British Library opened Propaganda: Power and Persuasion (CLICK). On 25 May the Museum of Childhood opened War Games (CLICK). And today the British Museum opened The art of influence: Asian Propaganda (CLICK). This exhibition covers the period 1900 to 1976, with unpublished and rarely seen posters, prints, drawings, money, medals, textiles and even teapots of political art from Asia. 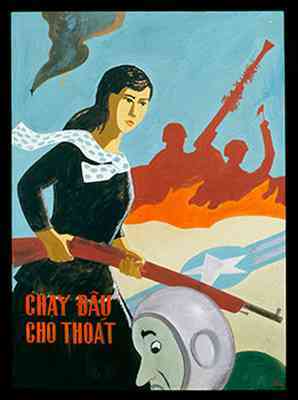 Shown is Nowhere to run to escape (Chay dău cho thóat) signed by unknown artist Ta. You'll find the exhibition in Room 91 until 1 September. Entry is free.